When Rob and Claire Colwill bought a dilapidated old stable complex by the sea, they took a ‘half-a-million-pounds leap of faith’. Most people wouldn’t have given the assortment of run-down buildings a second glance, let alone gambled a small fortune on them, but the rusty old farm outhouses contained a golden nugget — a Grade II*-listed medieval barn. Although it was on the verge of collapse, the barn’s stunning cruck frame was still intact, and Rob vowed to save it from wrack and ruin. ‘Our family was growing and we wanted to move to a bigger home,’ he says. The land and buildings, which the couple bought for well over the asking price, came with a 10-year-old house that also had a manager’s occupancy condition attached to it from when it was a riding school. This stipulated that it could only be built for the manager to live in. Luckily, the family were able to have this lifted, and it gave them a place to live in during the conversion — if they could get planning permission. Rob and Claire also agreed to wait six months for the previous owners to move out before eventually taking over the house. The delay gave them the chance to assess the site, seek advice from an architect and structural engineer, and prepare the planning application to renovate and convert the barn into one large dwelling. ‘The previous owners had unsuccessfully tried to turn it into a holiday let or several dwellings, but we wanted to turn it into one single family home for us,’ says Rob. Their plans were wholeheartedly supported by English Heritage, who had placed the barn on its national risk register and were keen to see it given a new lease of life, under the right circumstances. 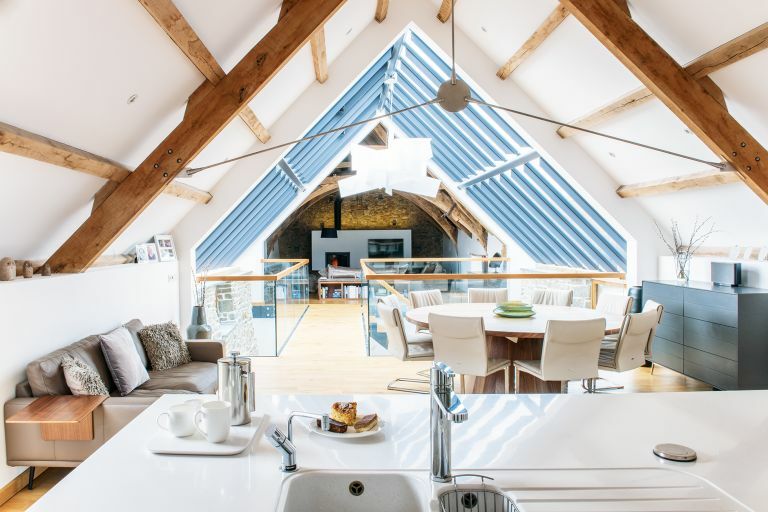 Backed by the architects’ carefully considered approach, and with assurances that they would respect the integrity of the ancient building, Rob and Claire were finally granted planning consent to transform the barn into a 120ft-long upside-down house with high-vaulted ceilings. The main living area would be on the first floor to maximise the impact of the timber frame. The barn was essentially in two halves — one side containing the medieval roof structure, and the other covered with a practical corrugated roof. The two sides would be united by a modern glass-and-steel mid-section — bridging the centuries. Building work began in January 2013, and the couple hired a local contractor they had known for years. By this time, they had sold their previous home for £500,000, most of which went straight into the renovation budget. Rob project-managed the build between running his estate agency and, with Claire, raising their three children.